DominicMonkhouse.com is made up of a team of expert business consultants, led by proven expert Dom Monkhouse. Providing specialist business coaching in London, Hampshire and throughout the UK, Dom and his team are passionate about helping businesses reach the next level. The range of coaching options they offer support businesses, helping them to become profitable and successful, year on year. 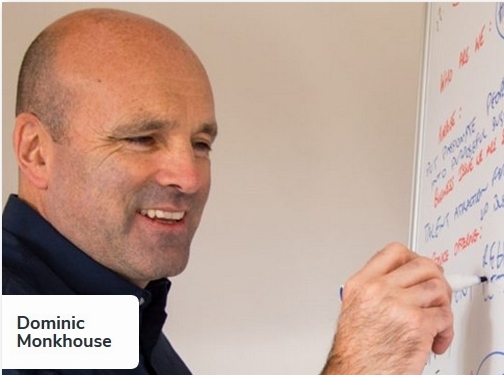 Whether it be improving your business growth via agile scale up training, or through the development of a one page strategic plan (OPSP), Dom tailors his coaching to fit the needs of each individual business. Not only that, but as a certified GazellesTM coach, Dom can offer Gazelles business coaching to companies, imparting his knowledge, tools and techniques on businesses, to help achieve fast and sustainable results. His team's tried and tested methods are currently in use by over 2,700 firms worldwide, having already helped a number of businesses to scale up their operations and improve profitability. Whatever the industry, Dom and his team provide coaching, training, strategy guidance and team building to support companies in fulfilling their potential. Interested in finding out more? Visit the website to contact the team today. UK (Andoverm, Hampshire) based business - established in 2014 - providing business coaching services. Website includes details of services provided, "meet the founder" information, regularly updated blog, full contact details including company registration and VAT numbers.